It’s no wonder many campers find RV electrical systems a little complicated. Throw open the front boot of an old caravan and, chances are, you’ll be met with an eye-watering array of devices, hardware and wires screwed into a piece of MDF, connecting to and from the house battery, with no way to determine what’s what. But, as they say, knowledge is power. And while the batteries in those old vans might tick along okay, their owners probably have no idea how to manage, or get the best out of, their power supply. With its BatteryPlus35 and Genius range of integrated power management systems, BMPRO put the power back in the hands of the people by creating sleek, ‘all-in-one’ products which are simple to understand and operate. Gone are the convoluted battery setups of old; BMPRO’s power management system does it all for you. The high-tech BatteryPlus35 systems come with an inbuilt battery charger, distribution board, fuses, DC outputs, inbuilt MPPT solar regulator (or solar regulator input on the 35PM), CAN bus connections, auxiliary DC input, load current unit, and low voltage disconnect. 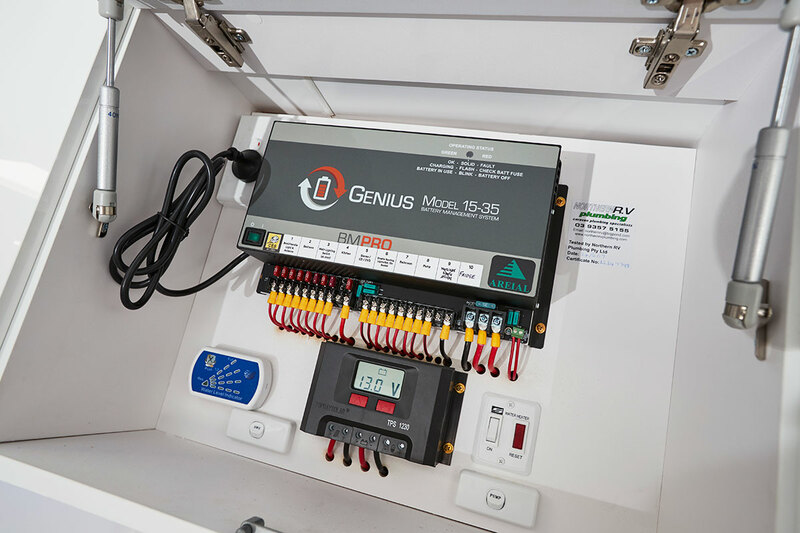 The first-generation Genius battery management system includes various charging modes, reverse polarity protection, over current and over voltage protection, fused DC distribution board, auxiliary input, and fault indicators. The BatteryPlus35 range include three different models with slightly different offerings. The BatteryPlus35PM is designed to work specifically with the BMPRO Trek battery monitor on lead-acid batteries and will interact with an external solar regulator. The BMPRO BatteryPlus35SR adds an inbuilt solar regulator with MPPT, outputs with various amperage, and solar/aux power blending on the input side. 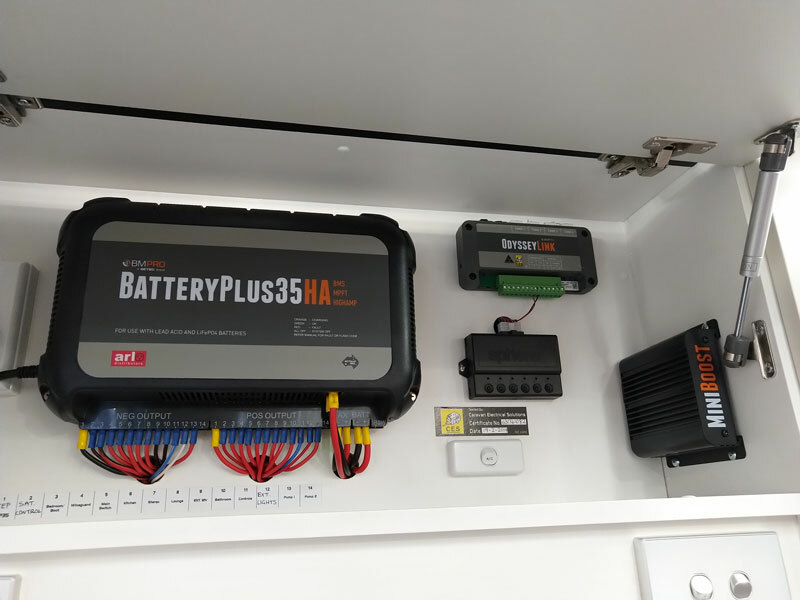 The BatteryPlus35HA is BMPRO’s top-of-the-line caravan power management system, designed for high-amperage battery charging and comprising all of BMPRO’s innovative technology. No matter what type of RV battery you run, it’ll be compatible with one of BMPRO’s management systems. While the Genius and BatteryPlus35PM work with lead-acid batteries, the BatteryPlus35HA is also compatible with the new generation of lithium (LiFEPO4) batteries which offer extended capacity and lifetime use. With in-built solar regulators, the BatteryPlus35HA and BatteryPlus35SR are capable of blending power from different sources to keep your batteries fully charged and in optimal condition. All BMPRO’s power management systems have a multi-stage charger, in different sizes to meet all applications: the Genius15-35 has a 15A charger, the Genius 30-35 has a 30A charger, the BatteryPlus35PM and BatteryPlus35SR come with a 20A charger and the BatteryPlus35HA has a larger, 30A charger. The chargers are all multi-stage, meaning they cycles through a routine of charging modes, designed to keep your battery at peak capacity and in great health, including the minimum of boost, float, store and trickle charge.